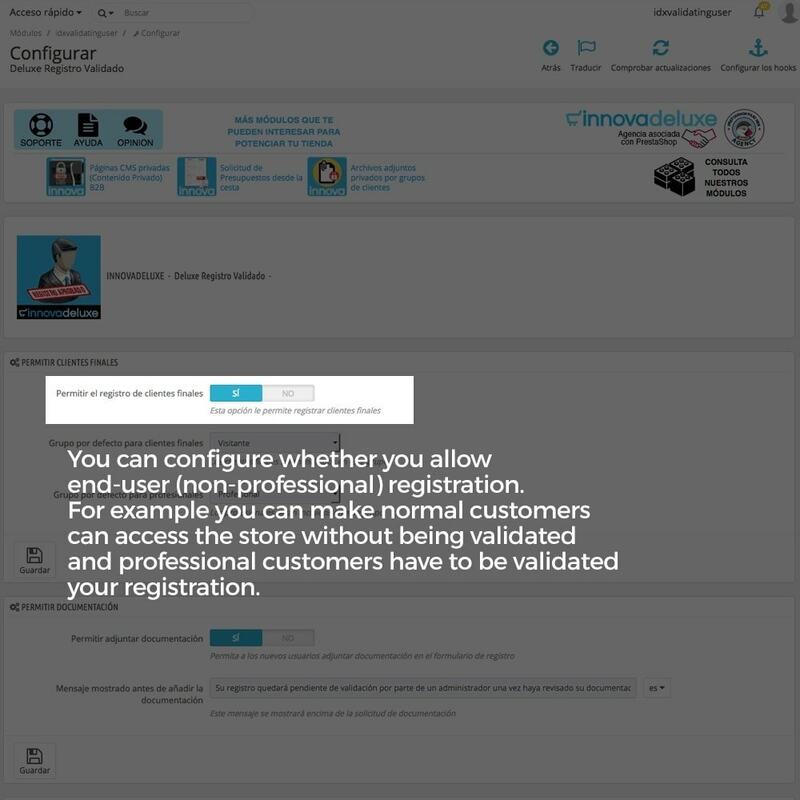 Ideal module for stores that want their customers registration to be validated or verified manually so that any customer can register at the store but will not be active until the store administrator has validated it. 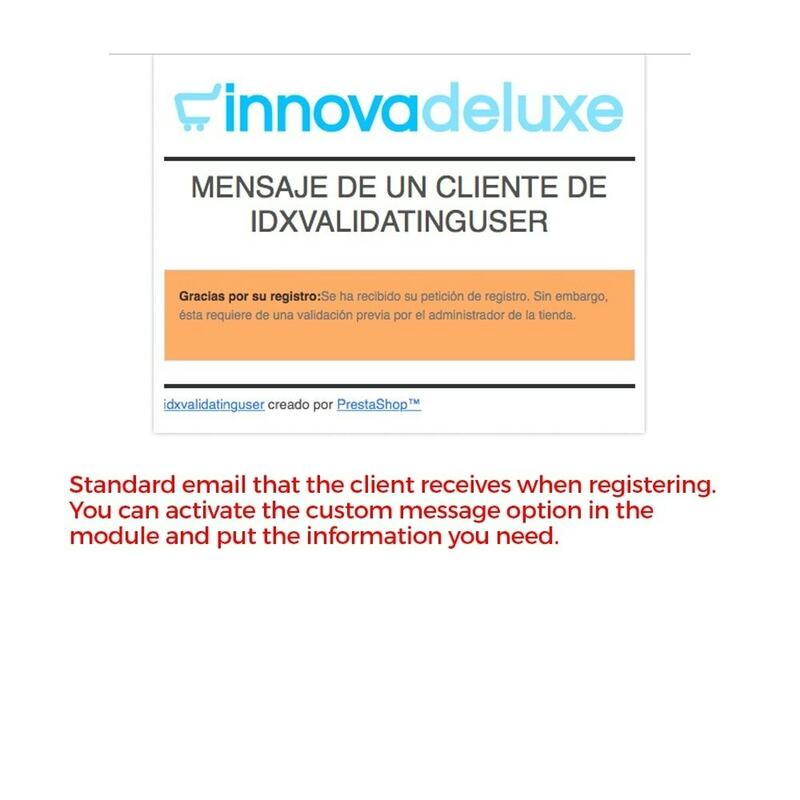 Once the registration is validated, the customer will receive an email informing that he can already buy in the store. 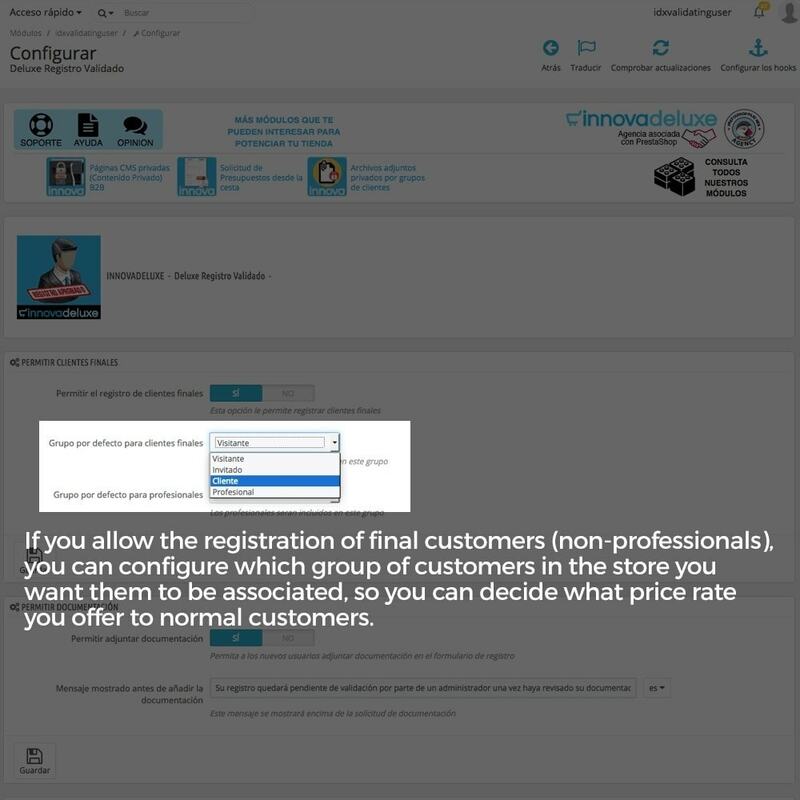 If you are not interested in registering more than the customers you want, here is the solution, because in addition the module allows the permanent removal of the registration requests that arrive to the store. 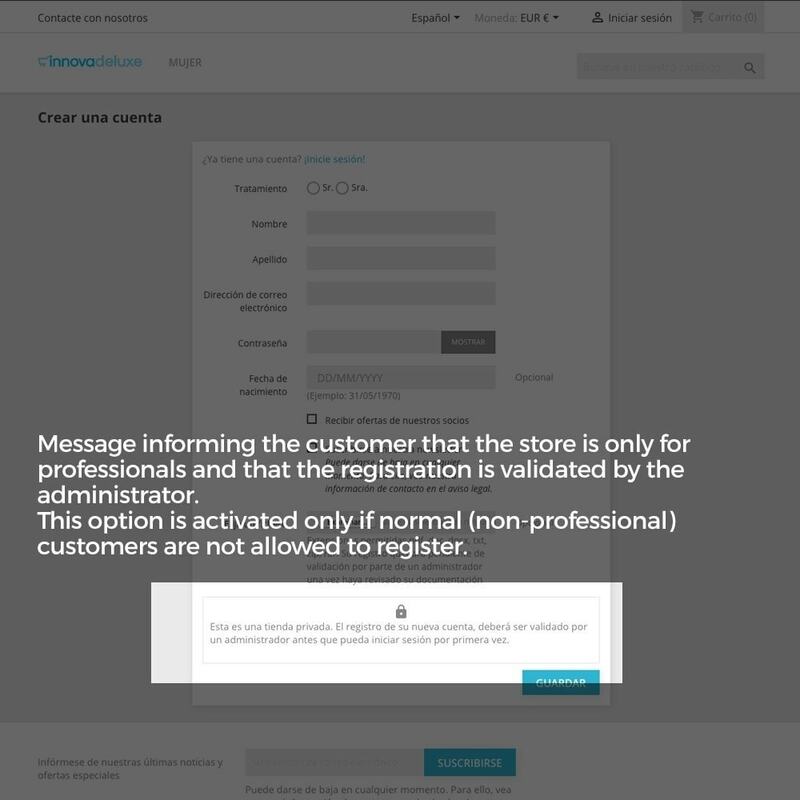 You will be able to request documentation to the clients in order to validate your registration in the store, the customers can send it to you at the time of registration. 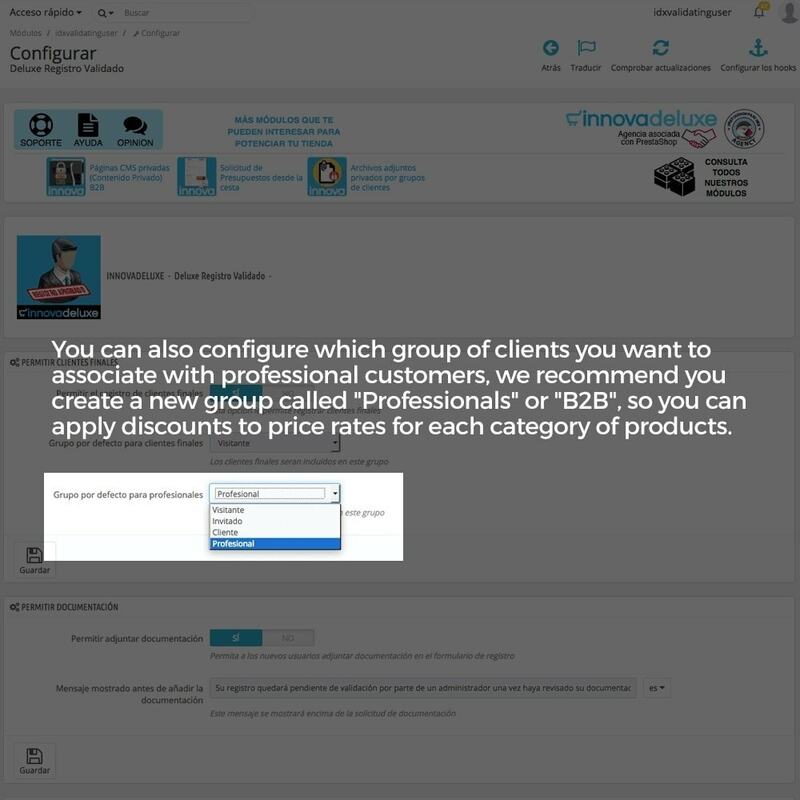 You can also have your store with two different profiles of clients, professional customers, which will have to validate your registration and will be associated with a special group to which you can apply discounts and also regular (non-professional) customers, which can be registered directly in the shop and they can make their purchases in normal way with the standard prices. 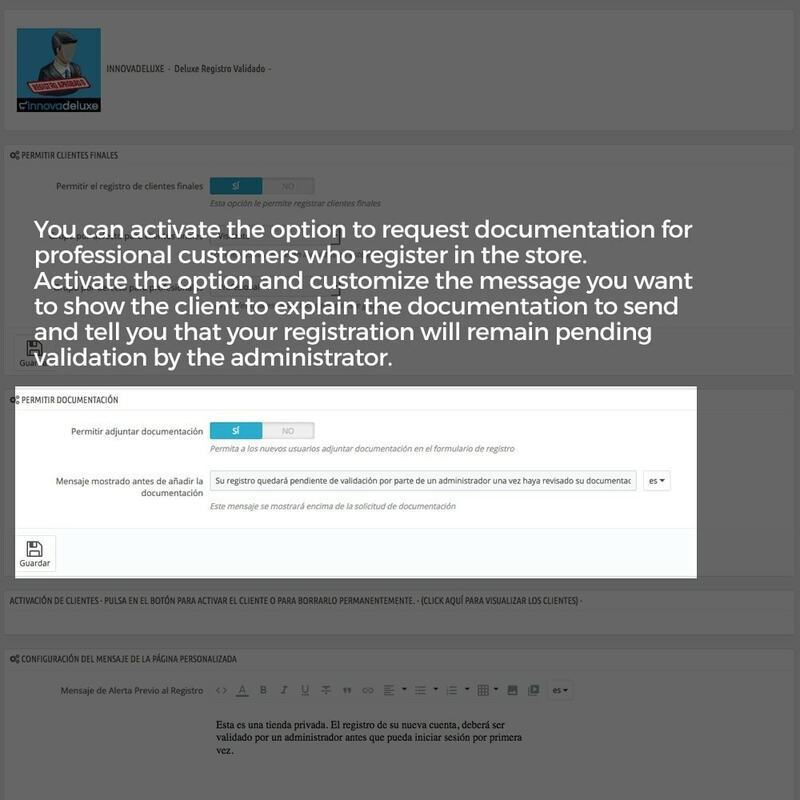 As an administrator of the store you will receive an email every time you have a registration to validate. 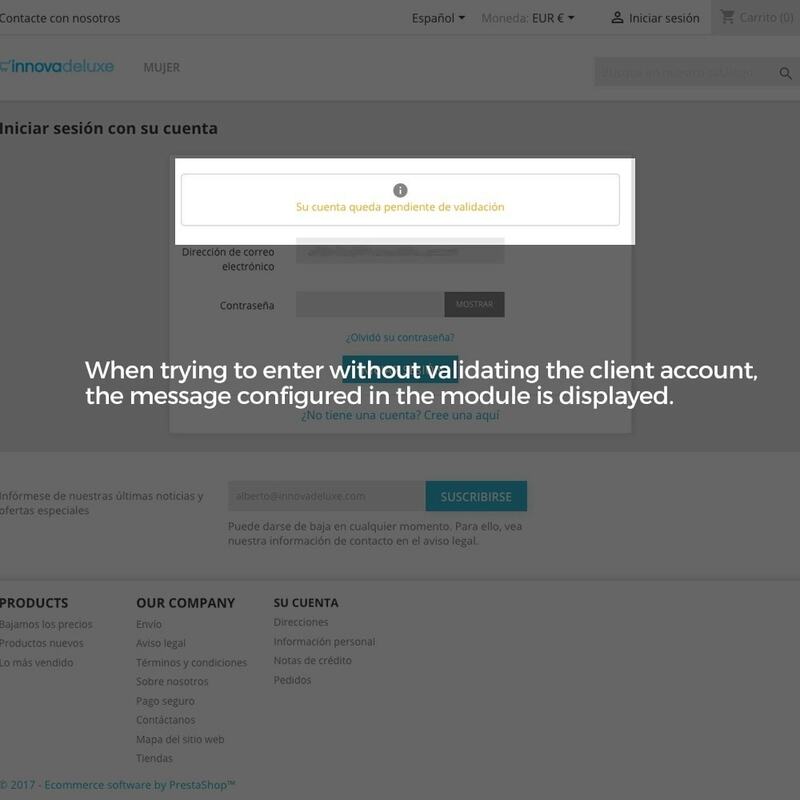 Your customers will receive an email when they register that their registration is pending validation, you can personalize this email from the module, they will also receive a second email once you have validated the account so that they can already access the store and buy. 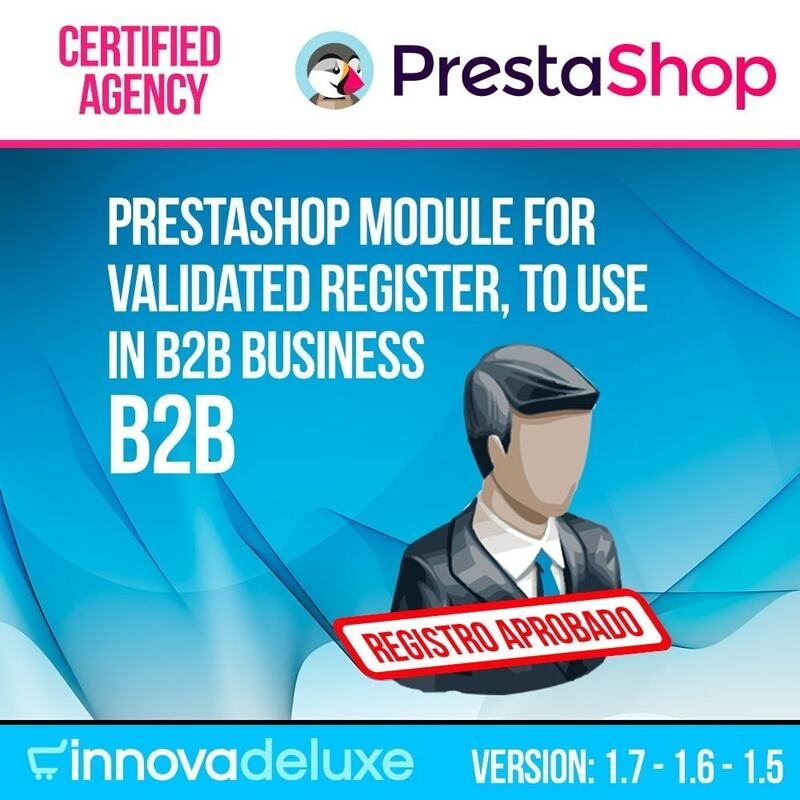 Turn your Prestashop store into a private B2B system for professionals only. You can also offer special conditions to special groups with a more VIP treatment, validating your registration so that they can access these special conditions. Configure if additional documentation is requested from professional customers to validate their registration. 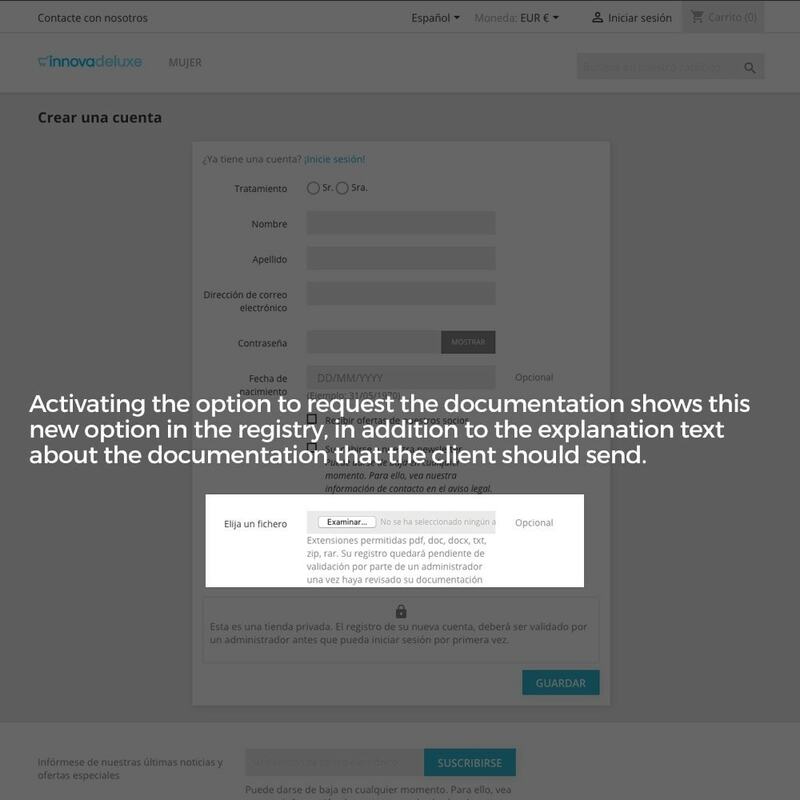 Customize the message that is shown to the client to explain the documentation to be attached to the registry. 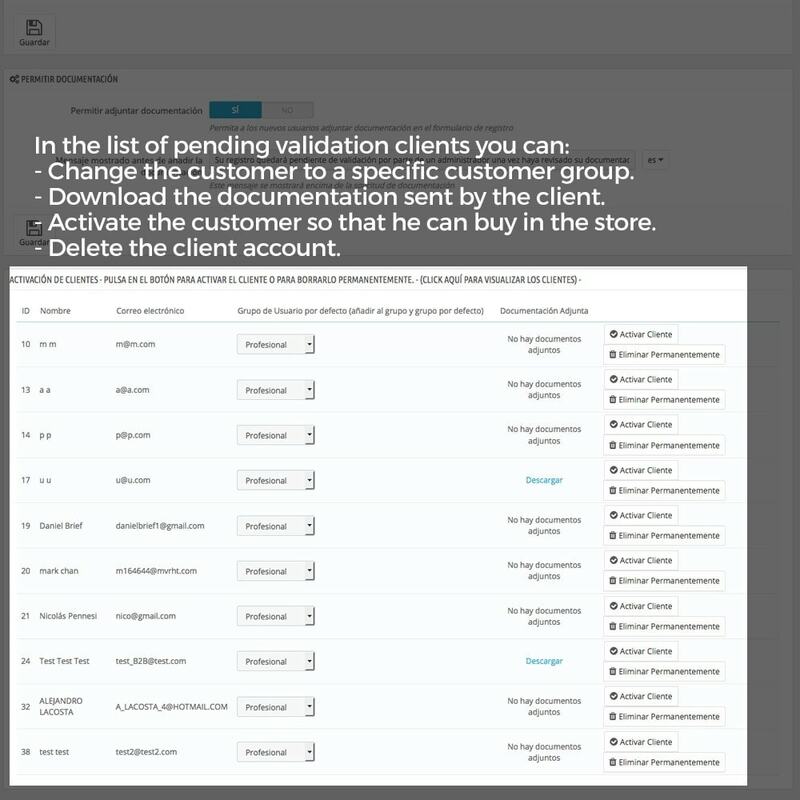 Change the pending customer to validate to a particular client group different from the one used in the general configuration. Download the documentation sent by the client that is pending validation. 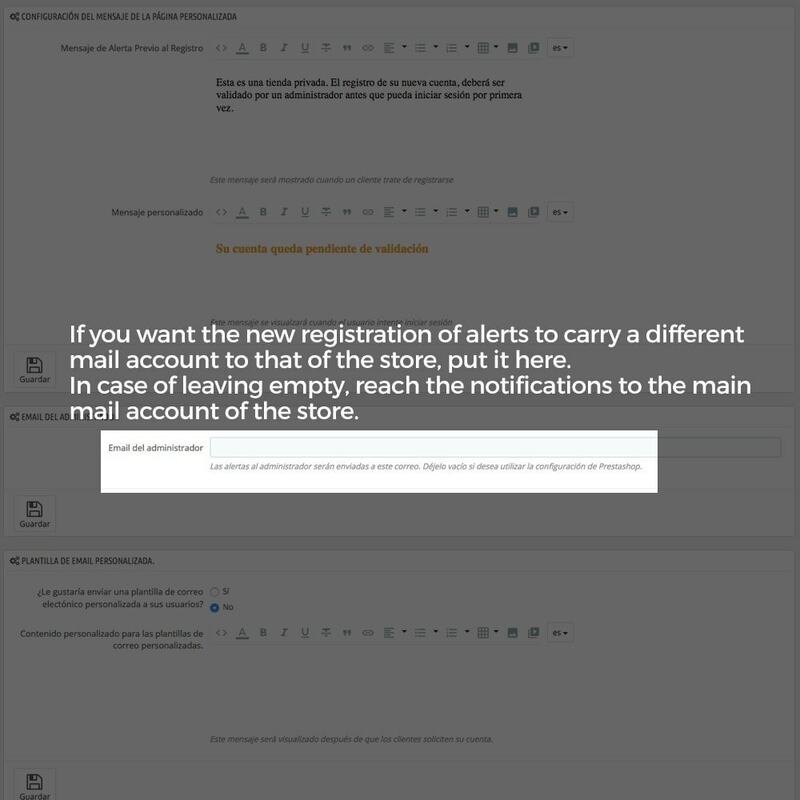 You can configure a custom message for customers to see when registering, to indicate that it is a store that requires the registration to be validated by an administrator. 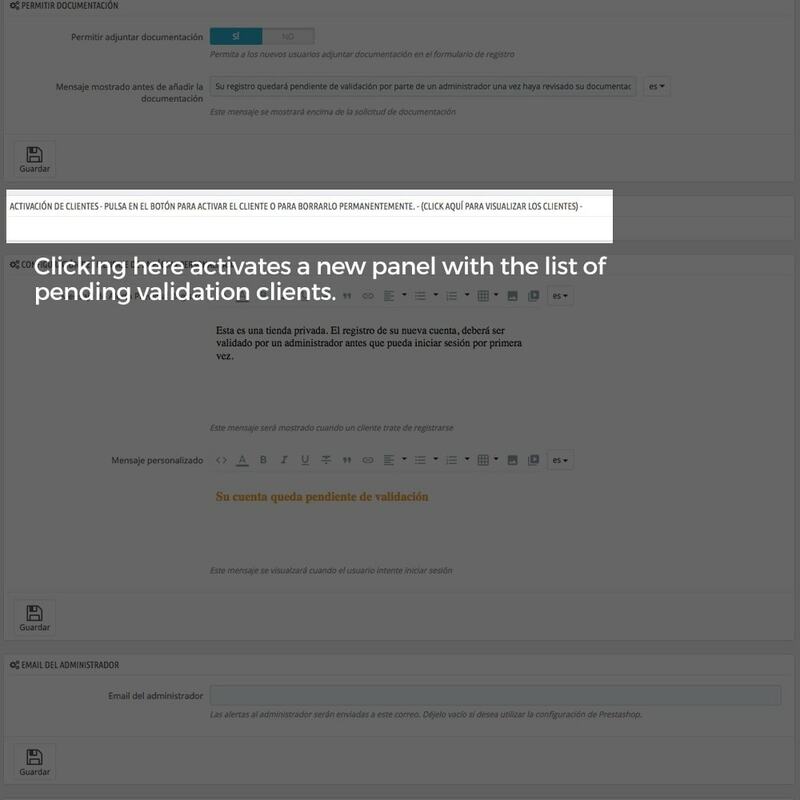 Set custom content on the page that a user will see when attempting to log in without being validated. E-mail notification to the user once validated. 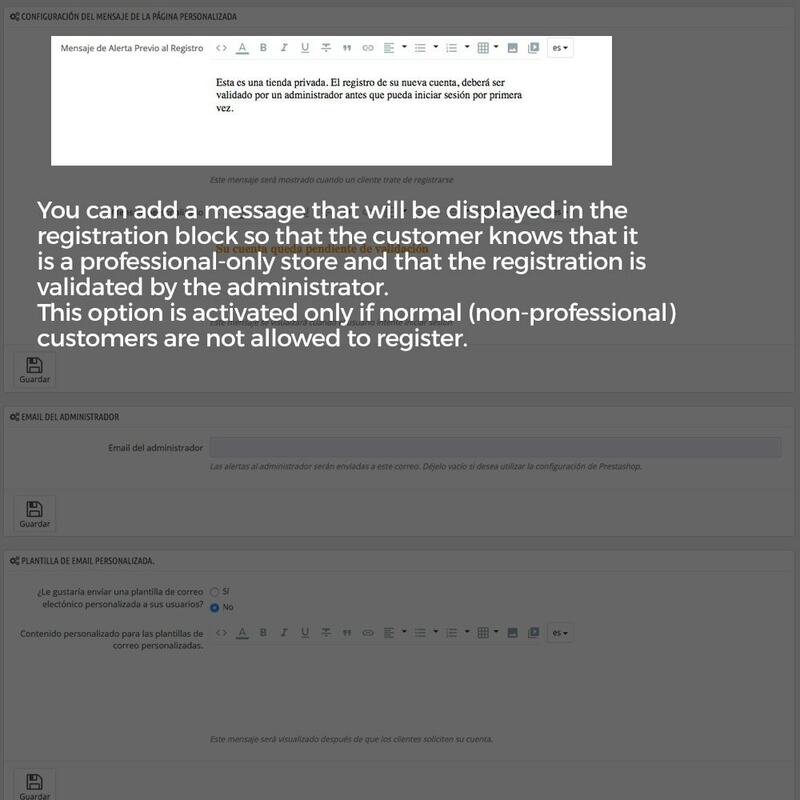 E-mail the store administrator each time you receive a registration request. 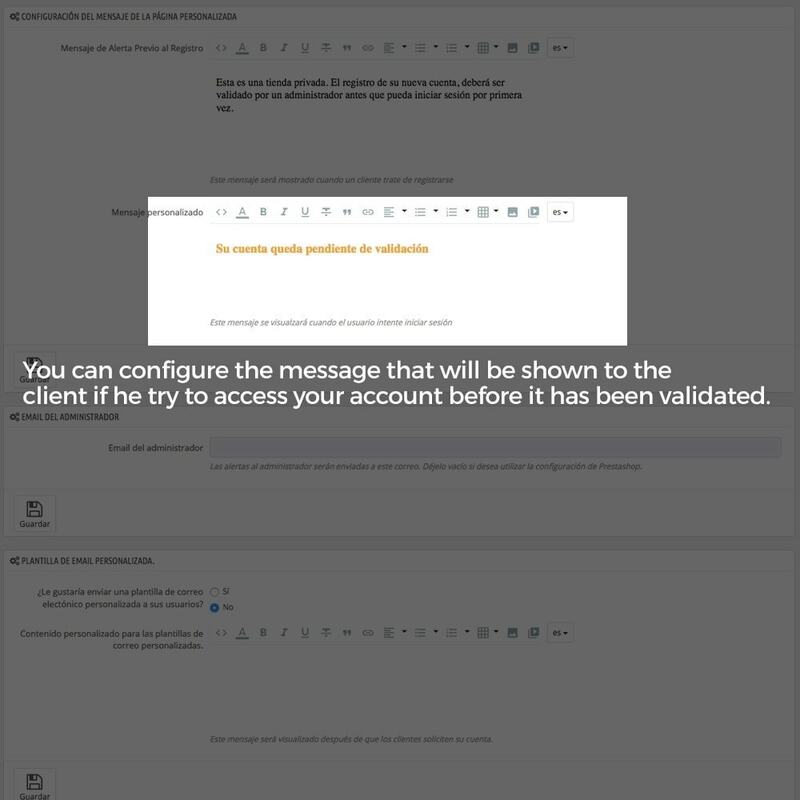 Allow to set up an email account to which new record notices will be sent. 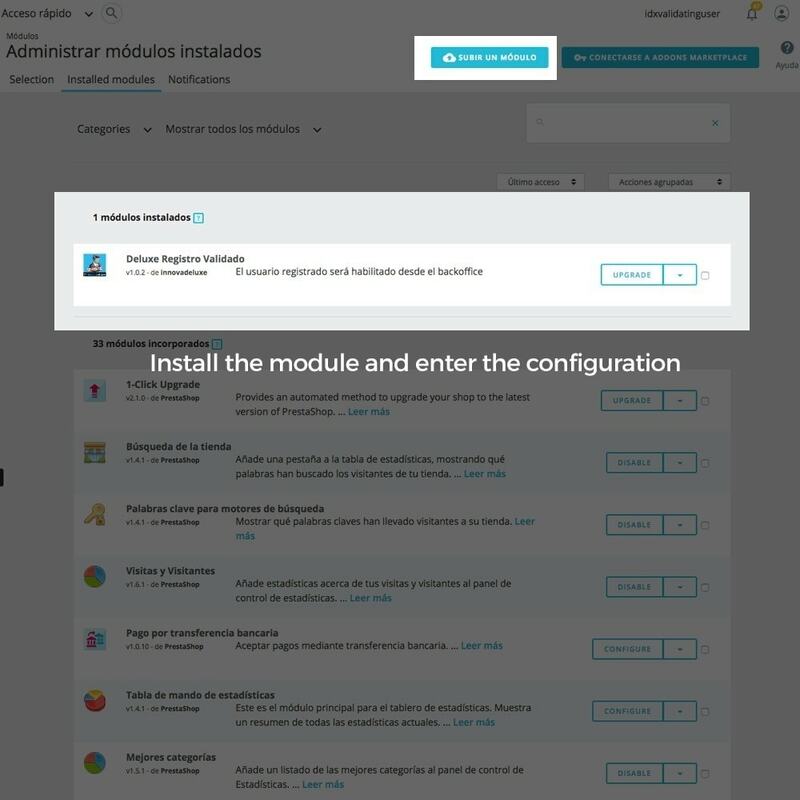 If this field is not configured, emails will automatically be sent to the email account that you will configure in the store as an administrator. 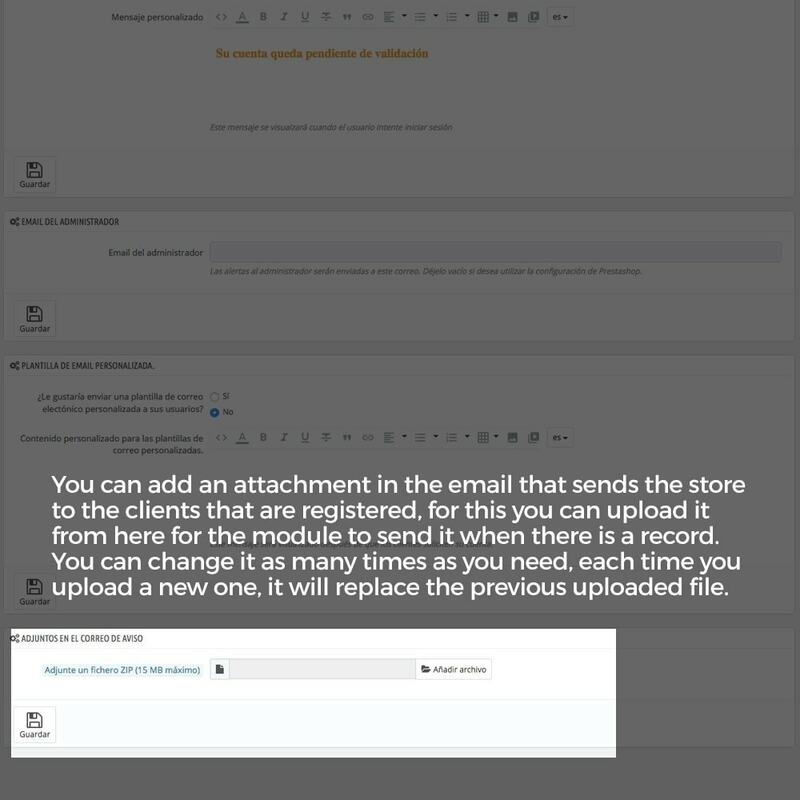 Allow to attach a zip file which will be sent as an attachment in the mail that the user receives when requesting registration in the store. 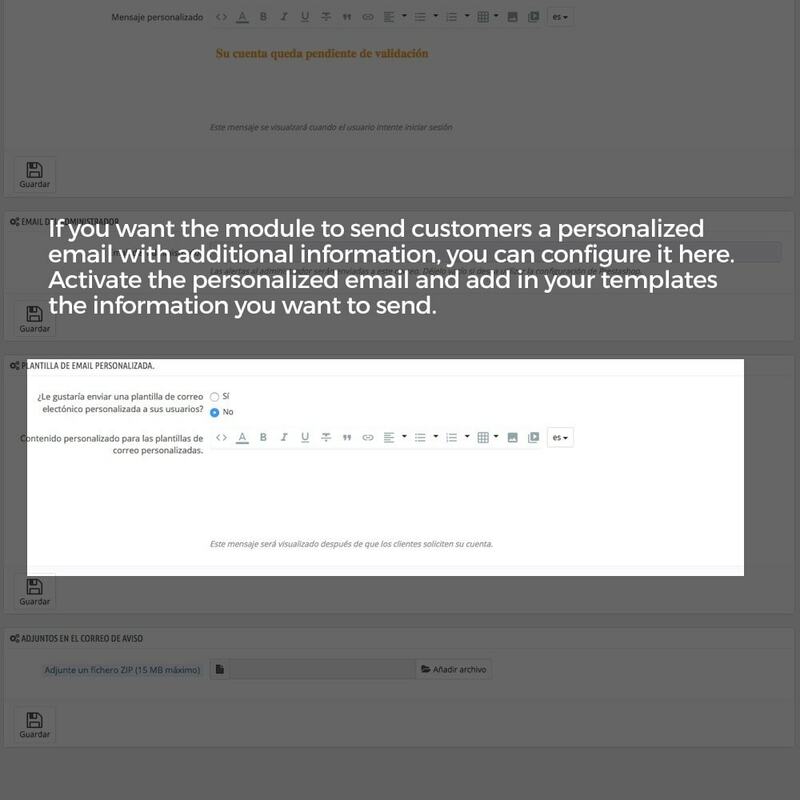 It allows to select between the standard email template of the module or a customized one for sending to the client. Consulta nuestro catálogo de módulos, tenemos otros muchos que pueden se de tu utilidad.